It does sound plausible to me. Nice that your pen is now without problems. Enjoy! Reporting back, after another few days, something seems to have caused the Jaipur to stop leaking in the cap, gratuitously, anyway. My thought would be the "heat-setting" of the feed. 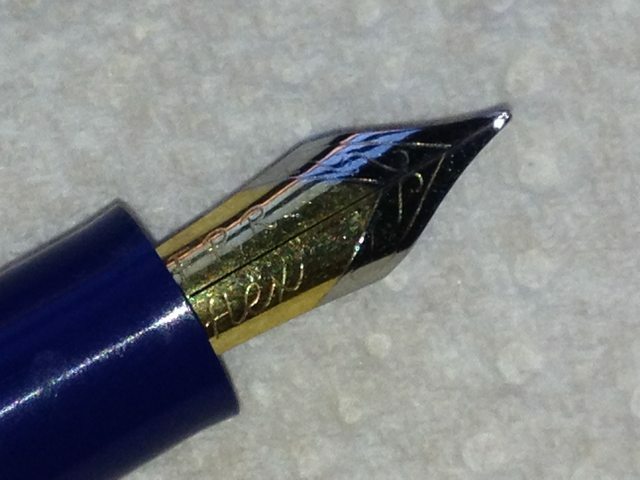 That is, dipping it in some hot water for 30 seconds and pressing the nib and feed together. My sense is that it may have made the feed conform a little more to the interior of the section, preventing leaks. Or I am completely full of (bleep). YMMV. Yep, it's entirely possible that heat setting could have that effect: if the leak is *between* nib and feed, bringing them into closer conformity can resolve it. 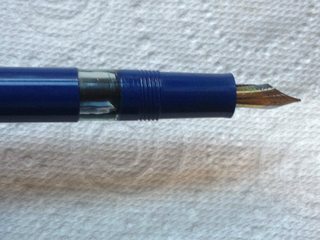 If the leak is *around* the nib and feed, you've got a bigger problem (which may possibly still be fixable, but nowhere near as easily) - so I'm glad you've got this sorted! Mine is still pretty leaky. I'm discovering the Jaipur is quite sensitive to which inks it likes, and subsequently, how leaky it is. With Diamine Oxblood it was super wet and constantly dripping ink into the cap. I changed to Diamine Eclipse and whilst still pretty wet, it's brought it under control some what. I also reseated the nib/feed, and used a little bit of grease, to help reduce the flow. Edited by Highbinder, 04 November 2015 - 08:58. United Inkdom have just posted a meta-review of the Jaipur and given it a pretty large thumbs-up! You can see the full write up (and, if you're very quick, win one in the give-away) here. 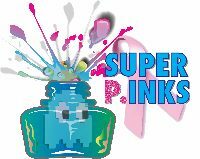 Thanks for cross-posting the link - I've been checking out the United Inkdom reviews recently and enjoying them. Please keep up the good work: it's a great concept, and you guys seem to work well together! I have received my Jaipur and certainly agree with the reviews as to aesthetics and construction. However, I have a problem with the piston filling nob. My first fill did not entirely fill the pen. In trying to add to the ink, I found that the the filling nob seems to be frozen in place. I cannot move it at all. My first suggestion would be, try removing the nib and feed, insert a cotton tip (an ear bud), and try applying downward pressure on the piston from above while turning the knob anti-clockwise. If that works, but the mechanism seems stiff, my second suggestion would be to try disassembling the piston assembly (there's a YouTube clip by Kevin from FPR on how to do that) - remove the piston assembly and apply some silicone grease. My third suggestion, if all else fails? Reach out to Kevin (hit 'reply' on your invoice email, or use the website), and ask for help and/or a replacement pen! Something else to bear in mind, folks: the Jaipur is on its first production run - and as a consequence, there may be some 'niggles' with the pens FPR send out. 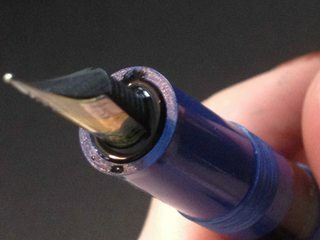 You can argue that every pen should arrive in the end user's hand ready to use and free of defects, but unfortunately that doesn't always happen. 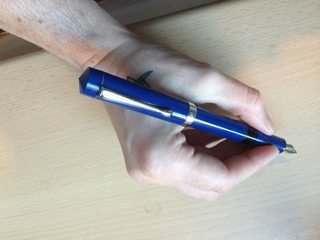 I know from experience with previous FPR pens that Kevin takes feedback seriously, and if there are any flaws that become apparent in the design (and/or manufacture process), not only will he 'make it right' for the customer who's been let down, he'll work hard to ensure that the next production run addresses those issues. 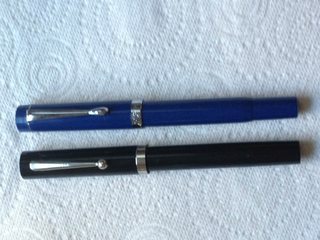 Having said that, all of three of my Jaipur pens are working fine for me. They're VERY wet - and I'm now thinking I may need to reseat and heat set the nib and feed on my latest (solid red) pen to reduce flow - but other than that I've found them a pleasure to use. The 'Indus' is a little more 'sophisticated' looking, and generally less of a gusher - but it's a little smaller (especially in diameter) and there's not much you can do to adjust its plastic feed. The 'Jaipur' is a more comfortable fit for my hand, and the ebonite feed makes it easier to hack and/or adjust the flow. Thank you for the three suggestions! I am not very handy ... this is a definite understatement. I shall give the first two suggestions a try and see if my skills, through some miracle, have improved! No worries - let me know how you go! Having been using my replacement Jaipur for a while now, I thought that I should post a quick review! (Not sure if I should have made this a separate post? - I can do that if people think I should...) I've actually come to really love this pen in the time I've been using. Yeah, it has some glitches - like the leaking into the lid that other people mentioned, and the fact that I often need to stop writing in order to push ink up into the feed (of which more later), but the way it writes absolutely makes it worth putting up with those things! 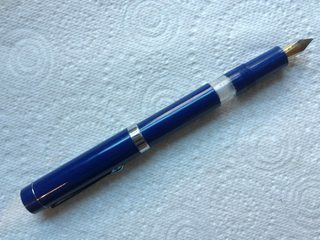 Kevin was *incredibly* kind and helpful with providing me with a replacement pen when my first one was faulty; I can't praise FPR's customer service enough! It also came with a free "Serwex Special" eyedropper! First off, the appearance. It's not what I'd call precisely elegant, but it's handsome, solid and well-propotioned, with a classic sort of look and a nice touch to the end of the cap, which looks a little like there's a cap jewel. The end is gently rounded off. The silver fittings, with "FPR" discreetly and handsomely engraved on the cap band, are quite stylish. 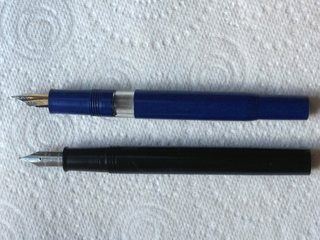 To give an idea of size, here it is compared to the most similar pen I had, a Sheaffer No-Nonsense. As you can see, there's not a great deal of difference in size and the overall size is similar, though the ends of the Jaipur are different, there's the additional clip band, and of course there's the narrower end on the Jaipur that's part of the piston mechanism. The plastic *did* smell very strong when I got it; it's faded somewhat now, but it *is* still detectable, if that's something that really bothers you. It's neither excessively shiny nor matt, and has a pleasant, smooth, just-this-side-of-greasy (in a good way) feel to it. It's large enough that I at least find it easy to write with unposted (my hands aren't huge) but I prefer to write with it posted because it's very well-balanced that way. The cap unscrews (rather than clicking on) in three twists. The threads aren't too obtrusive when you write with it, especially if you hold it near the nib. 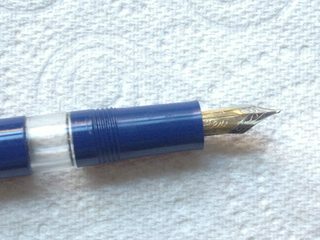 Near the nib there's a slight flare, which is attractive but I found I was holding it there when I was flexing it more extremely and it did become a little uncomfortable - though it also protected me from any ink in the "reservoir". 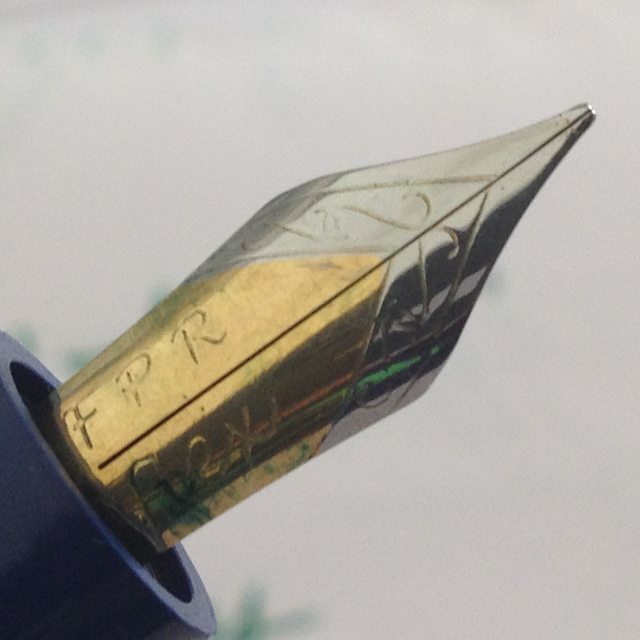 The nib itself is very handsome, two-tone with some scrolling and "FPR" and in this case "flex" engraved on it. 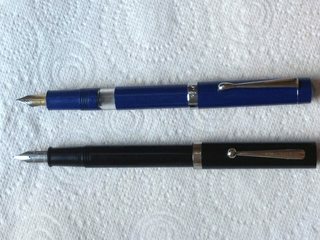 Although when I started using it it was quite stiff (though not scratchy like the faulty one I initially received), it's softened up, and is now quite easy to flex - though it does require pressure, so is by no means a wet noodle or in any way comparable to a flex dip pen. 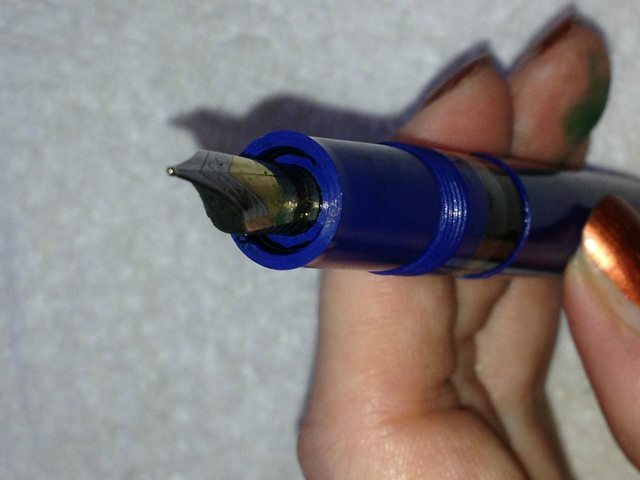 As you can see, though, it's possible to flex it quite extremely for a modern fountain pen! You can get a nice contrast of thick downstrokes and hairlines. When not flexed, I'd call it a firm medium. 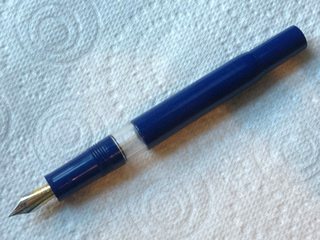 Overall I like this pen a *lot*, though I wasn't wholly sure when I first got it. 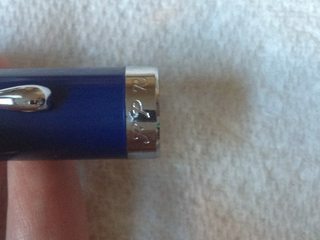 I would totally recommend the Jaipur to anyone wanting a very affordable, flexy if stiff fountain pen, especially if any of the kinks get ironed out in later manufacturing runs. Definitely a winner! I wonder if anybody experiences "hard-starting"? 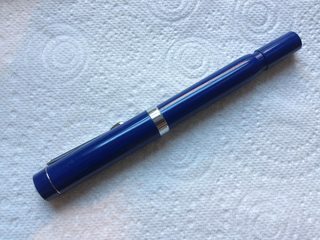 My pen arrives this morning (blue demonstrator) with flex nib. I inked up straight away without flushing the pen.A great wet writer and I like it a lot. However, from time to time, I need to shake a bit to get going again. I have just flushed it and water and a drop of detergent. 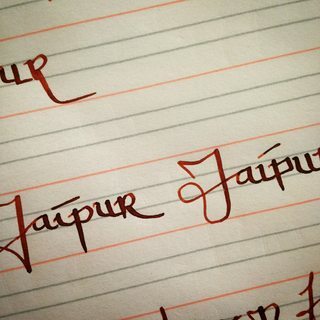 I really like the Jaipur, and the ones I have inked up at the moment work very nicely. Like almost everything I have bought from FPR so far, I have no complaints. I just bought mine and I am loving it very much. 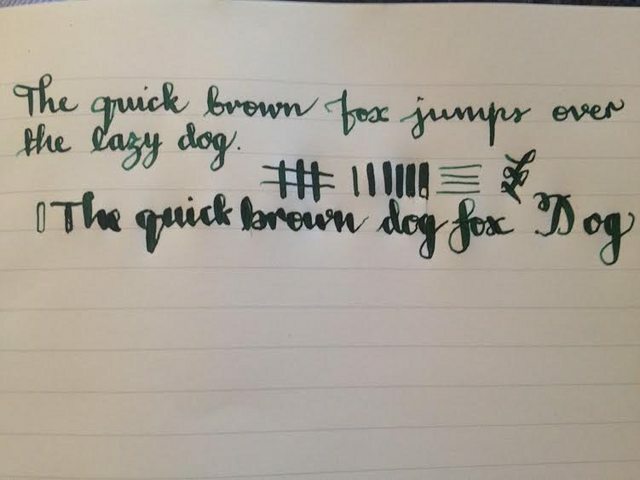 It writes a wet medium juicy line and it has a flex nib. 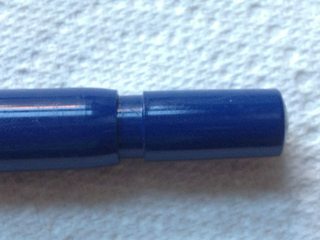 The only observation that I must report is that the pen smells like acetate or some other chemical. The odour is ok but how can I get rid of it? Any ideas? There has been a lot of discussion on this, with variable efficacy. I haven't tried them myself (I am fine with the smell) but the suggested ways range from leaving it it the sun to baking soda. Search for Noodler's odor removal. They are made of the same material.